Get a fascinating portrait of the most acclaimed oral historian of the United States — a Pulitzer Prize winner and a tireless supporter of radical causes who earned a place on the McCarthy blacklist — in Studs Terkel: Politics, Culture, but Mostly Conversation. Dennis Kucinich says “Alan Wieder reminds us of Studs’s extraordinary effervescence, his endless quest for the truth, his attainment of a place in the pantheon of America’s greatest patriots.” Order this book by clicking here! The following is the Truthout interview with Alan Wieder on the life of the venerable Studs Terkel. 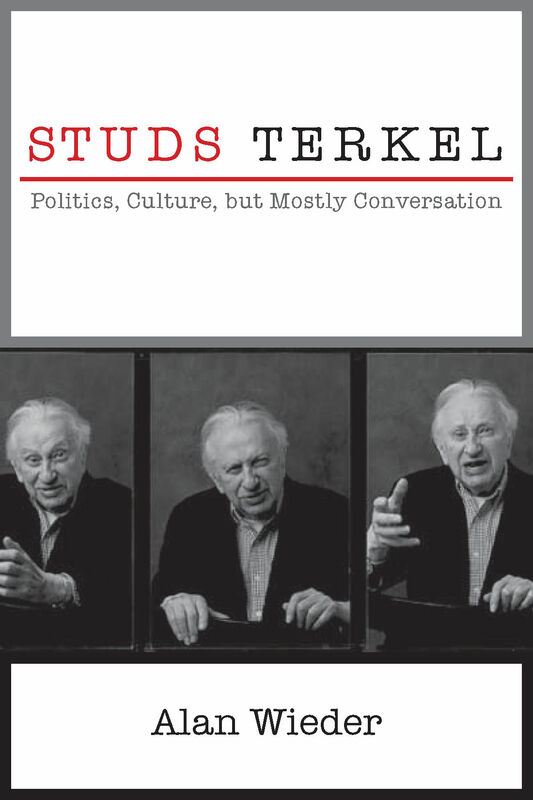 Mark Karlin: Studs Terkel was sort of a Renaissance man of the left. Can you list some of the different fields in which he distinguished himself? Studs was on the stump almost up until the day he died. Throughout his life, progressive organizations marveled at his willingness to talk at political rallies — union protests, anti-war demonstrations and more. One of his final acts was as the named litigant, Terkel v. AT&T, on the “yet to be United States of America” spying on it’s own citizens. Explain Terkel’s impact as an oral historian on you and on the book and how it is written? I began studying for my doctorate in the mid-1970s and knew I wanted to use personal interviews in my research. It was a time when this type of work was not respected in academia. But I was fortunate to have a committee [that] liked Studs’s books: Division Street, Hard Times, and Working. As a university professor I continued to write oral histories or to use interviews in my work. From the beginning, I felt that it was Studs’s work that made my own possible. Studs didn’t refer to himself as an oral historian — he didn’t need the label. But his books were/are so powerful and he taught me what was important to write — lives. First, respect [for] the person you are interviewing. Studs had a mantra: “Let the person talk about what they want to talk about and not talk about what they don’t want to talk about.” So yes, maybe you bring someone back to an original theme. Or maybe you ask them to take something further. But Studs was not a confrontational interviewer. Yet, often people he interviewed responded by saying that he got them to talk about things they didn’t even know they thought or felt. Studs liked to be amazed! So do I. The second lesson is one word. “Listen!” Crazy, because Studs was such a talker. He never shut up, except, when he was doing an interview. It’s odd because my last two projects — a book on South African revolutionaries Ruth First and Joe Slovo and this one on Studs — both use interviews to make the books, but unlike Studs’s work, the people speak about Studs, not so much themselves. Makes me want my next project to be more of a Studs-like oral history. Obviously, Terkel was a great listener, but he had tremendous dramatic flair that provided him early on with a career on radio and on TV in Chicago. How were his ability to perform and listen interrelated? Studs Terkel liked to be amazed. He loved stories that took twists and turns and he loved to be surprised. But he also always surprised us. He had been an actor, both in theater and in radio soap operas. In the latter he always played a gangster who was either dead or in jail by the third episode. He listened because he always believed there could be wisdom in the room and he defined room very broadly. Studs had conversations on the bus, at the corner market, on the street, everywhere. People I interviewed talked about when Studs was engaged it was total. Alan Wieder. (Photo: Monthly Review Press)Some people also reminded me that when he wasn’t engaged, it was very clear. I experienced both parts of Studs the one time we met. He was almost 91 years old at the time and was about to be interviewed at a conference in front of around 1000 people. Friends who had organized the event generously wanted me to meet him but the only time available was the 15 minutes before he went on stage. I should also add that his hearing was shot by this time. I had come back a month early from living in South Africa for the event and was brought to sit with Studs in the corner of the hotel ballroom. He had absolutely no desire to talk to “another professor.” I tried for a few minutes and mentioned that I had just returned from South Africa. Studs Terkel came alive. Not talking about his 1963 trip to apartheid South Africa or his friendship with Nadine Gordimer, but rather asking me to tell him about South Africa at the time — what’s happening on the ground, Iraq War protests, AIDS, who did I know and more. And more than anything else, leaning in to me because of his bad hearing, Studs Terkel was totally in the moment and listening. Needless to say, Terkel was a great champion of the issues of his day, including civil rights, unions and opposition to the Vietnam War. How did he manage to be a great idealist and dissenter while also preserving his ability to listen to persons of opposite beliefs and record their views? Studs talked about people and events that helped shape him. Growing up in his parent’s men’s hotel and listening to the Wobblies who lived there arguing with the people who believed IWW stood for I Won’t Work, religious fanatics, atheists, etc…. He also spent a lot of time listening to soap box speeches at Bughouse Square, Chicago’s version of Hyde Park in London. Studs explained that the Great Depression had a great effect on his view of the world. But when he talked about interviewing, radio or books, he mentioned the filmmaker, Dennis Mitchell, who was looking for the hurts in people. Studs found humanity in people whose politics were different than his own because he saw in individuals their pain. Not the Clintons or the Trumps. Hell, he was totally critical of politicians ranging from Mayor Daley to Reagan to Clinton to Bush and more. But people on the ground were different. So the interview that pained him the most was of a Chicago cab driver who was a neo-Nazi. Studs saw his pain. Studs realized that the only place he was ever excepted was within that group. It was a conversation that although I maybe overstating, haunted Studs. Terkel was a particularly fervent voice for the working people of the United States. When we lost him, it appears we lost a major writer/oral historian who could connect with the working class and provide them with the dignity, respect and participation in democracy that they deserved. There’s no one quite like him in that respect today, is there? Such a hard question. I was asked the same question at Jane Addam’s Hull House [in Chicago and] Red Emma’s bookstore in Baltimore, and just a few days ago at the Oral History Association conference. Often people make the case for Terry Gross. I listen to her show and like it but I don’t think she gets to the conversations people had with Studs. For me, Studs was having a conversation and Terry is interviewing — good interviewing but not Studs-like. Politically, I think you could make a case for Amy Goodman. Studs really liked two people who still have radio shows, Marc Steiner in Baltimore and Leonard Lopate in New York. Alan Wieder’s engrossing biography of the acclaimed author and oral historian of working people. I’m too close to it. I often cringe when I hear interview shows. However, I’ve done a lot of interviews for the book and only one person didn’t read the book. Studs would have let him have it because he knew him. I thought that the people who interviewed me, including Rick Kogan and Tony Macaluso in Chicago, Marc Steiner in Baltimore, and Bill Nigut (who interned with Studs at WFMT) in Atlanta, all read the book carefully and asked questions that had great depth. In terms of his books, there are wonderful oral historians and a group called Voices of Witness that is publishing oral histories with depth and breadth. I like to think that I interview like Studs or at the very least I try to. All this said, Studs was Studs and none of us are him in terms of conversation and/or social issues. Terkel was irrepressibly interested in people. He took great joy in interviewing them — well-known reformists and activists and other people — about their challenges in cobbling together enough work to survive. He seemed fascinated by the great resilience of the human spirit, don’t you think — and that indomitable spirit might just eventually prevail? Transformation stories were most important for Stud. Who could have ever written Will the Circle be Unbroken (Studs called it his death book) before Hope Dies Last (Studs called it his hope book). Only Studs could do this in the last decade of his life. His editor, Tom Engelhart referred to it as Studs-like. Three transformation stories come to mind but there were many more. Studs loved telling the story of Chicago activist Peggy Terry who came from the rural south and championed the fight against class disparity and racism in Chicago. He also often talked about the ex-neo-Nazi (not to be confused with the cab driver discussed above) who found life in the white racist group but came to an understanding of the hatred and became a social worker on Chicago’s southside. Finally, the story that Studs called his most important was with C.P. Ellis who went from being Klan leader in Durham, North Carolina, to the union representative at a 95 percent African American union at Duke University and an activist for civil rights. Studs told the story again and again and referred to it as his most indelible. $10.10 is not enough to address the problems of inequality for working women and help them achieve their American dream. Davis Cohen sat down with Make the Road New York to talk about the rising tide of local law making. A profound movement is emerging among workers in developing countries, demanding radical action on grievances outside the system of established unions.